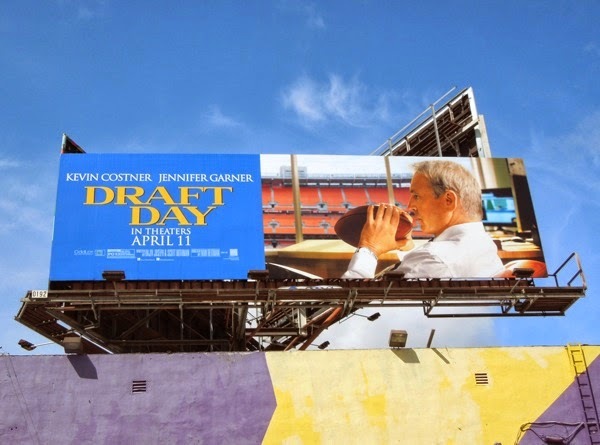 2014 has already been a busy year for Kevin Costner, with roles in Jack Ryan: Shadow Recruit and 3 Days to Kill, but will Draft Day will the touchdown that the actor is looking for. Often for every box office success like Dances with Wolves and Robin Hood: Prince of Thieves, there's a dud like Waterworld, so which will this new American Football drama be. 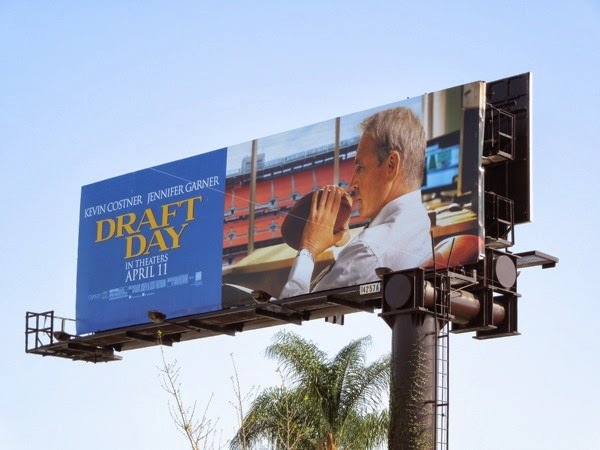 In Draft Day he stars as 'Sonny Weaver', a general manager for the Cleveland Browns struggling to acquire the number one pick for his football team on the day of the NFL Draft and having to decide what must be sacrificed personally and professionally in the name of perfection. 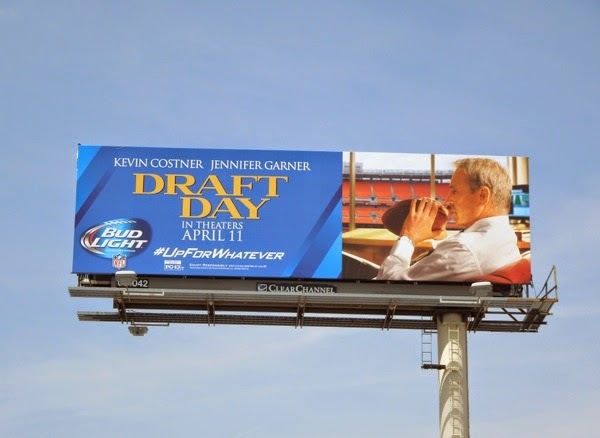 This sporty ad creative certainly conveys that Kevin Costner has a big decision to make in this movie and was first spied along Highland Avenue on March 21, then along San Vicente Boulevard just before the Sunset Strip on March 26, 2014. 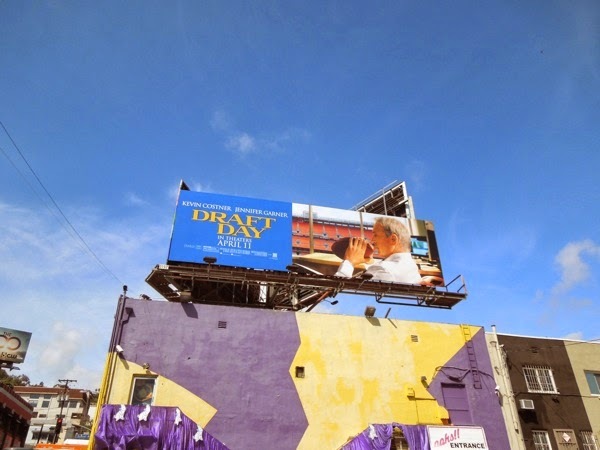 If you're a fan of the actor, be sure to also check out these Jack Ryan: Shadow Recruit movie billboards from earlier this year. 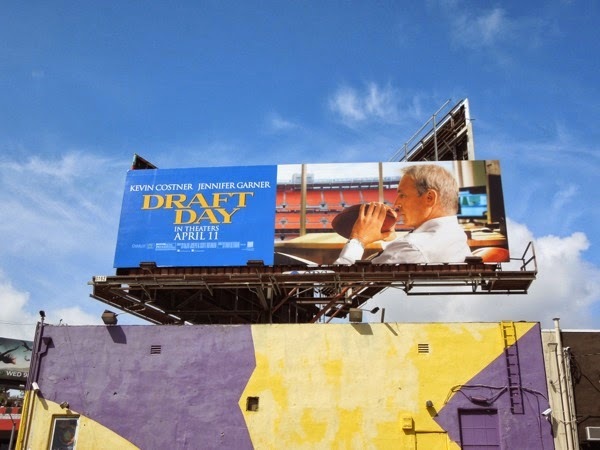 UPDATED: Here's another version of the movie billboard, snapped along La Brea Avenue on April 23, 2014, this one incorporating some kind of product placement with Bud Light, which makes sense as they are the official beer sponsor of the NFL and this film is all about American football.